Start with your feet a little wider than your hips and your feet turned outward slightly. Pull your shoulders down and keep your lower back flat. 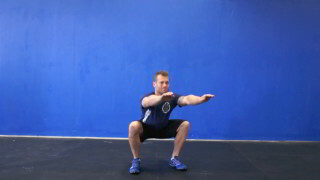 Squat down below the knee putting most of your body weight on to your heels. Make sure your back stays flat at the bottom and your knees track over your toes. Stand back up to the starting position by pressing through your heel and driving with your glutes.